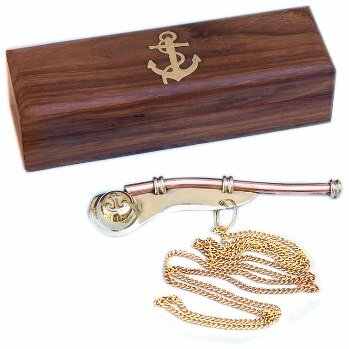 Home › Home and Kitchen › Hampton Nautical Solid Brass/Copper Boatswain (Bosun) Whistle With Rosewood .. The Hampton Nautical Boatswain's Pipe (pronouncedinchbosun's inch) is one of the oldest and most distinctive pieces of nauticalequipment. The boatswain's pipe, whistle, or flute, was used in Greece andRome to keep the stroke of galley slaves. This beautifully detailed solidbrass and copper Navy Boatswain's Pipe comes with a quality 39 inch solidbrass chain lanyard. The pipe has a traditional anchor design inlaid in copperon both sides. The boatswain's pipe measures 5 inches (12.7 cm) long, and thepipe and chain weigh 1.6 ounces (45 grams), and yes, it really whistles.Theboatswain's pipe comes with a beautiful solid hardwood felt lined storage anddisplay case. Solid brass and copper no plastic parts 39Ã¢â‚¬ chain lanyard brasslinks keep whistle secure Traditional design of a bosunÃ¢â‚¬â„¢s pipe Fullyfunctional actually works From the Manufacturer The Hampton NauticalBoatswain's Pipe (pronounced "bosun's") is one of the oldest and mostdistinctive pieces of nautical equipment. The boatswain's pipe, whistle, orflute, was used in Greece and Rome to keep the stroke of galley slaves. Thisbeautifully detailed solid brass and copper Navy Boatswain's Pipe comes with aquality 39 inch solid brass chain lanyard. The pipe has a traditional anchordesign inlaid in copper on both sides. The boatswain's pipe measures 5 Inch(12.7 cm) long and the pipe and chain weigh 1.6 ounces (45 grams) and yes, itreally whistles. The boatswain's pipe comes with a beautiful solid hardwoodfelt lined storage and display case.